Autism Spectrum Disorder: He Prefers to Play Alone | Free eBooks Download - EBOOKEE! Posted on 2018-08-22, by perica123. 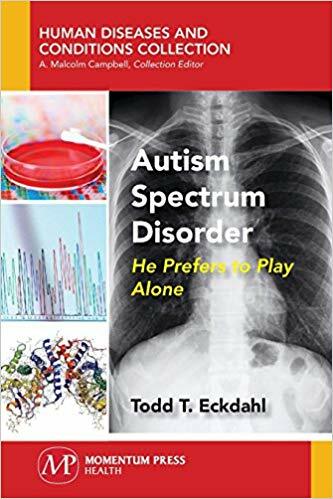 Todd T Eckdahl, "Autism Spectrum Disorder: He Prefers to Play Alone"
This book is an overview of autism spectrum disorder (ASD), an early childhood condition that affects 1 in 68 children in the United States, and an estimated 1 to 2 percent of children worldwide. ASD causes impaired social skills, communication problems, and repetitive behaviors. The severity of ASD symptoms varies widely, ranging from mild effects with minimal impacts on functionality to severe effects that interfere with functionality and can prevent independent living. ASD is a complex trait disease caused by mutation of multiple ASD susceptibility genes, but it also occurs as part of monogenic genetic syndromes. Genetic testing for ASD is described in the book, and e x a mples of ASD susceptibility genes. No treatments are available for the core symptoms of ASD, but the book describes therapies and drug treatments that can modulate them and address some of the health complications of ASD. The book presents new ASD biomarkers that can be used for better diagnosis and explores the hopeful prospect of personalized medicine for ASD. 2018-09-20Building Reasoning and Problem-Solving Skills in Children with Autism Spectrum Disorder A Step by Step Guide to the Thinking..
2018-07-30Building Reasoning and Problem-Solving Skills in Children with Autism Spectrum Disorder A Step by Step Guide to the Thinking..
No comments for "Autism Spectrum Disorder: He Prefers to Play Alone".